My guest today is Emily Copeland from Table Life Blog. She is sharing today on how to homeschool in the middle of a busy season of life. Emily’s tips are fantastic to help you keep going when you can’t do it all. I believe in creating margin. I’m a fan of fewer commitments outside the home so I can serve my family well and lead with intention. I care about how I steward the time I have with my kids, and I believe in saying no to the good so I can say yes to what’s great. All of those things have a lot to do with why we homeschool in the first place. But what about homeschooling when you can’t avoid the crowded schedules and overextended day-to-day grind? What if you’re in a busy season of life and there’s nothing you can do about it? How do you keep your sanity without sacrificing the education and commitment your kids need from you? Here’s the thing: life happens. You’ll have new demands on your time and attention at some point. It’s inevitable, but these things don’t have to derail your homeschool. Whether you’re selling your house and planning to move, working outside the home, serving in ministry, dealing with medical issues, helping extended family or friends, or something completely different, you can homeschool well in the middle of it all. It’s tempting to put homeschooling on the backburner when life feels chaotic, and distraction runs rampant, but doing nothing isn’t usually the best approach. 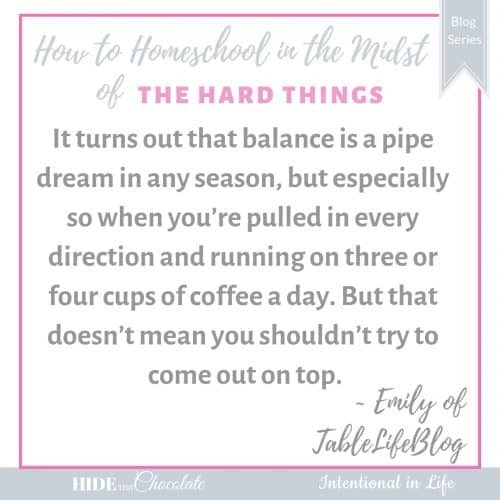 Instead, steady homeschooling can be the very thing that provides stability and routine for your family when you’re in a busy season. So, if not homeschooling isn’t an option, how do you do it all when there’s not enough of you to go around? Well, you don’t. It turns out that balance is a pipe dream in any season, but especially so when you’re pulled in every direction and running on three or four cups of coffee a day. When you’re homeschooling in a busy season, you’ve got to consider which subjects deserve priority status and which subjects can shift the “if we have time” category. Whatever your non-negotiables turn out to be, simply identifying them will help you know how to move forward with your educational goals regardless of how overextended you are. If math and language arts are your non-negotiables, make sure those get done each day or at least a few times each week. Then work in history, science, music, art, and other subjects as time allows throughout the week using a modified loop schedule. If you legitimately don’t have time for those remaining subjects over the course of a few weeks, don’t worry about it. That’s why there’s a distinction in how you approach the priority subjects and all the others. Address the priority subjects first, but let the others roll over as long as needed and work them in when you get a chance. Whether it’s two or three hours a day, three afternoons a week, or two full days each week, find a block of time to set aside for homeschooling and be faithful to it. The amount of time you choose doesn’t matter nearly as much as your faithfulness to it. If you give this time away, you lose the opportunity to establish some sense of normalcy for your homeschool in this not-so-normal season and keep your kids somewhat on track with their educational goals. Do what needs to be done with your outside commitments, but do them outside of this guarded time. Your guarded time is your guaranteed chance to work on what matters most — hence those non-negotiables — in your homeschool. The important thing to remember is that it’s okay if this time doesn’t reflect your usual productivity. These blocks of time aren’t a way to cram your normal homeschool to-do list into a few hours a week; this is for the non-negotiables only. Everything else can fall into place somewhere else, with or without your involvement. You may find some relief in changing your approach to specific subjects when you’re homeschooling in a busy season. For example, you may prefer a literature-heavy homeschool approach, but learning through television may help you accomplish that “if we have time” list when there’s a lot going on. Television, workbooks, co-op classes, and other non-literature approaches may not be how you prefer to teach your kids, but if those avenues are helping you make it all happen, thank the Lord for them and get on with your day! These changes in how you homeschool don’t have to have to last forever and they aren’t going to scar your children. They’re much more likely to remember your faithfulness when reflecting on their homeschool years than the three-month span you relied on Liberty’s Kids and a workbook to help you teach American history. And if they do remember watching a lot of Liberty’s Kids? Well, it’s nothing more than an example of how you improvised and kept things rolling in your homeschool when it’s seemed impossible. Guarding your time and changing your approach are both important, but making room for fun and your relationship with your kids matters, even more, when you’re homeschooling in a busy season. Ultimately, this comes down to showing your kids there’s more to your homeschool agenda than the core subjects. That means you don’t neglect what’s life-giving for your family. This is how you keep from getting so caught up in your busy season that you take for granted the flexibility and freedom that homeschooling gives. In other words, be a moment maker. Stop what you’re doing and take a walk. 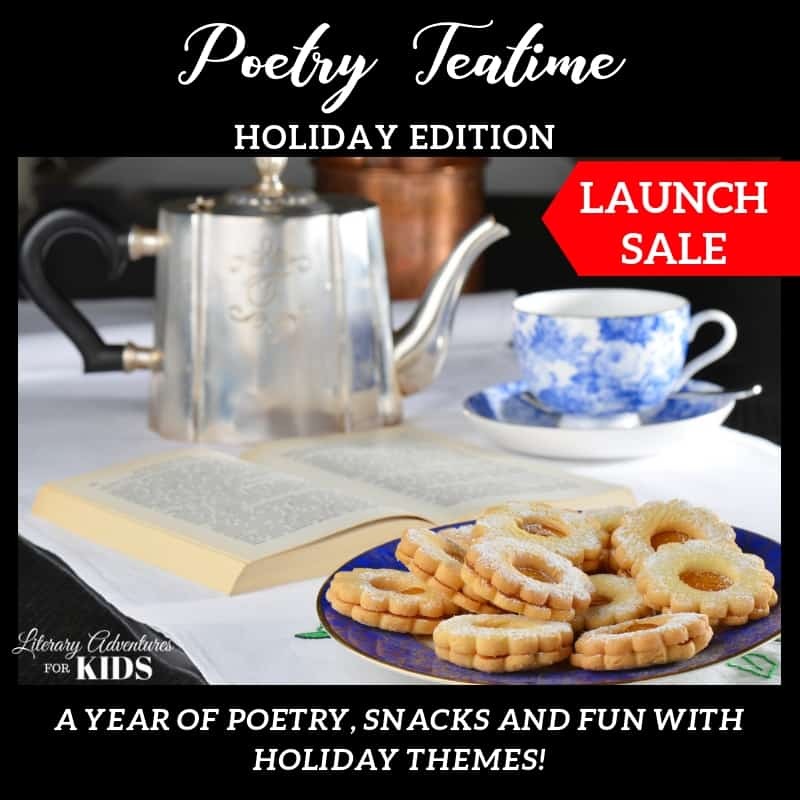 Push the science lesson aside for the day and set the table for poetry teatime. Say yes to the musical that’s coming to town, say yes to the field trip, and say yes to the gameschooling. Hear me out. I’m all for checklists, and I’m all for productivity and being responsible with my time. I’ve experienced seasons where prioritizing, guarding my time, and changing my approach literally kept us on track with homeschooling. 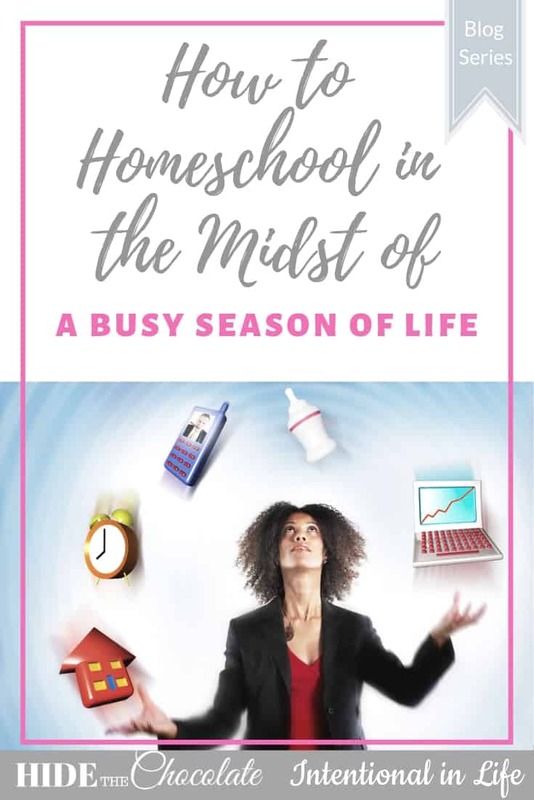 But I can say from experience that a season of busyness is no excuse for a business-only homeschool. Guarding my time and being flexible with my approach may have saved my sanity in the busy times, but that’s not what kept my kids feeling loved and seen. Instead, it was going to the park in the middle of the day, pushing our normal language arts aside to do fun writing prompts, and raising butterflies just for the sake of raising butterflies. All that to say, my kids didn’t mind the changes to our schedule or approach because we didn’t lose the heart of our homeschool when life seemed crazy in every other way. Making moments with my kids is what made that possible. Regardless of how busy you are, you’re never too busy to celebrate the wins. And even if you’re not quite where you hoped to be in your homeschool because of all that busyness, there’s always something to celebrate. Learn to recognize what’s going well in your homeschool and celebrate it with your kids. They need to know their work isn’t unnoticed and unappreciated. They need to know you’re not too busy to make a big deal out of their efforts. Don’t think the celebration is just for the kids, though. Guilt, exhaustion, and frustration are often part of the deal when you feel overextended. You can combat those feelings by celebrating your wins. Finishing a read aloud, getting around to the art project that’s been on your to-do list for two months, visiting a local botanical garden, completing all the non-negotiables for an entire week: it all counts and it’s all worth celebrating. In closing, remember your busy season isn’t your forever season. Honor your outside commitments as long as needed, but find your way back to normal as soon as possible. Until then, take things one day at a time and give your kids and yourself grace as you navigate the chaos. This is day 13 of the Homeschooling in the Midst of Hard Things Blog Series!. We are so glad you are here! Check out the rest of the series by clicking the banner below. Emily is a Christ follower, wife, homeschool mom of two, and a church planter. She offers practical ideas for home education and encouragement to help you make the most of the moments around the table at tablelifeblog.com. Get Our Current Free Course! 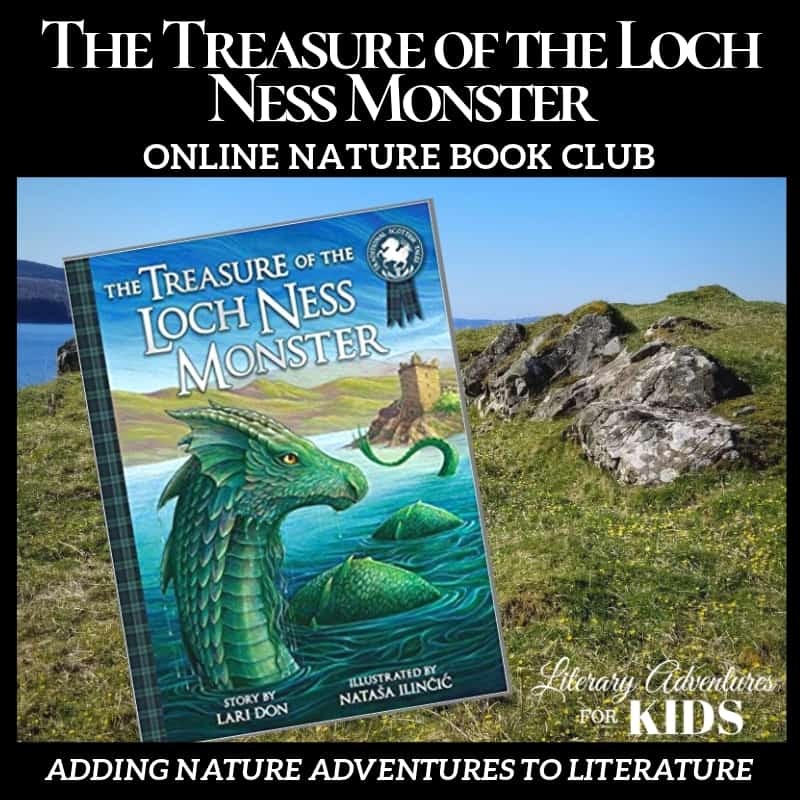 Subscribe for access to The Treasure of the Loch Ness Monster Online Book Club. 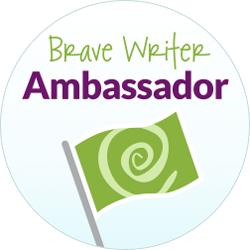 By subscribing to receive this freebie, you understand that you are agreeing to receive periodic emails with additional freebies, fun ideas and homeschool deals. You can unsubscribe at any time. Thank you for subscribing to Hide The Chocolate. Check your email! Are you wanting to inspire your kids to read? Check out some of our literature studies! 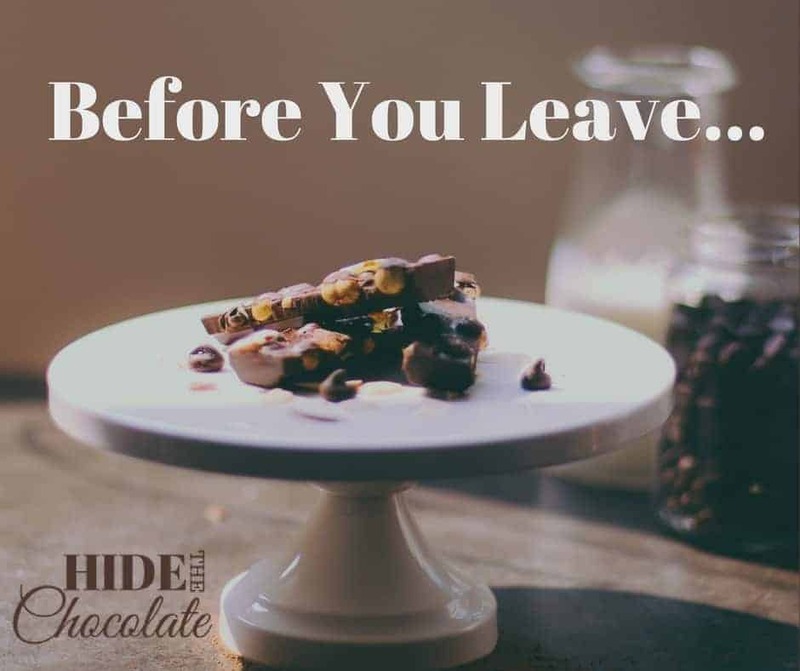 Meet me in the Chocolate Closet for subscriber free printables and this month's FREE online book club!